In an attempt to create content for the blog, I’m going to start doing brief rundowns of the beers I drink when I open new, cool stuff. Got off from work around 11:15, started re-heating leftover pasta sauce for dinner. 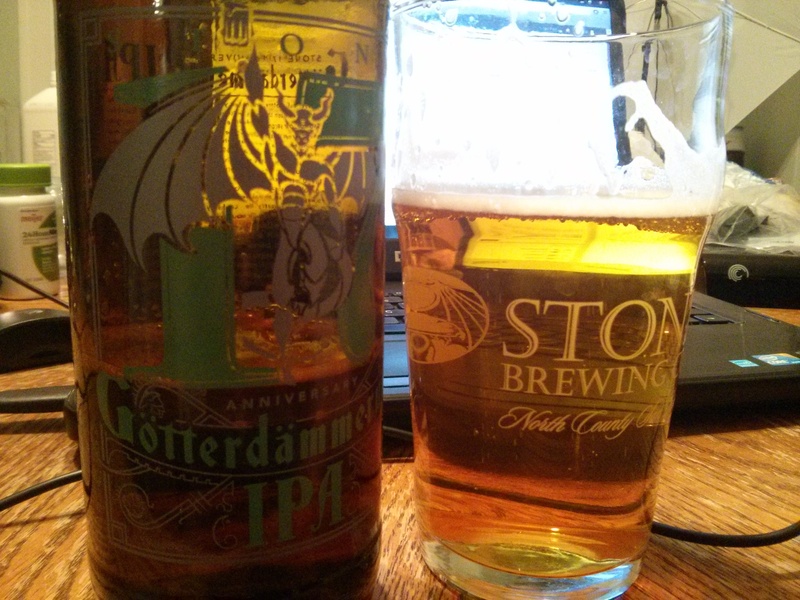 Cracked the brand new Stone 17th Anniversary Gotterdammerung IPA, all German malts and hops. Slightly darker than straw yellow color, more of a light orange/brown with a thin head. Aroma and flavor are all earthy spice, as expected from an all-German hopped beer. I wish it had a bit more body to back up the hops and to accentuate it’s “German-ness,” but ultimately Stone made the beer they want to make. Nine percent ABV. Lots of hops. Late night. I think that’s it for me (especially after a large and very late dinner). Cheers. Another beer sent to me by my buddy Ryan. We get Stone in my area but for some reason we never seem to get any of the collaboration beers. This one is a good idea and well-put-together, but it doesn’t quite work. It’s solid and interesting and makes me want to play with those ingredients in my homebrew, which makes it worth trying even aside from the charitable nature of the beer, but overall it’s just a “solid” example of an IPA.